Significance : It is considered as the Acharya Peetham, meaning the Holy Throne of the Supreme. Jaipur, the pink city is a major tourist destination in India which have palaces, forts etc. The temples of Jaipur also attract tourists in large numbers and Galtaji is one among them. Galtaji is an ancient Hindu pilgrimage site in the town of Khania-Balaji, situated on Jaipur-Agra Highway at a distance of 10 kms away from Jaipur in Rajasthan State. The temple here is famous for its natural water springs. It is considered auspicious to bathe in the waters of Galtaji, especially on Makar Sankranti and every year in mid-January, on 'Makar Sankranti', a large crowd of visitors come here to take a dip in the holy kund. It is also believed that Saint Galav is believed to have spent his life and meditated. It is considered as the Acharya Peetham, meaning the Holy Throne of the Supreme. Galtaji Temple, dedicated to the Sun God, Lord Surya, is located in the Aravalli hills and is bounded by dense trees and bushes. Nestled in peaceful surroundings between two granite cliffs, this impressive building is ornamented by painted walls, adorned by rounded roofs and pillars. This 18th century magnificent temple which looks like a Haveli was built by Diwan Rao Kriparam, an aristocrat of Sawai Jai Singh II, on the top of the hills with pink sandstone. The walls of the temple is adorned with exquisite paintings and carvings. As the temple complex is always surrounded by lots of monkeys, it is sometimes known as 'the Monkey Temple'. These monkeys were featured in National Geographic Channel's Rebel Monkeys series and "Thar Desert - Sacred sand" episode of Wildest India Series.The sacred shrine is an eye-catching and interesting for nature lovers and photographers. There is an interesting story behind this temple. 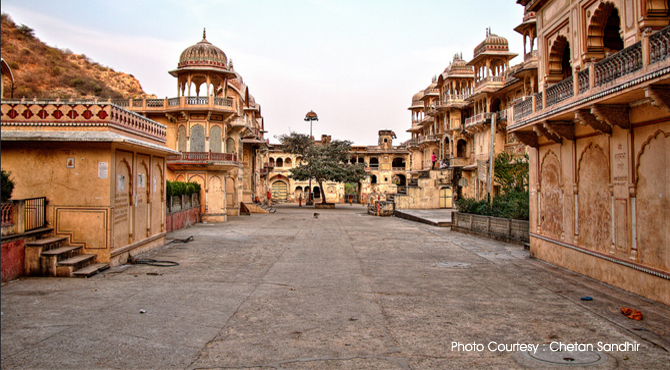 According to legends, the area around the Galtaji Temple once faced with water scarcity. It was then that a sage named Galva spent all his life here and performed his 'tapasya' for 100 years. Pleased with his penance, the Gods appeared before him and blessed his place of worship with abundant water. To honour this great 'rishi', a temple was built here and it was named after him. Taking a dip in the natural springs of Galtaji is considered very auspicious and is said to cleanse a person of his sins. Temples pavilions and holy kunds (natural spring and water tanks) along with lush landscape make it a delightful spot. Among the seven kunds located here, the most holiest and the sacred one is the Galta Kund. It is believed that by taking a dip in this sacred tanks the devotees will get relief from all sins. Several other shrines named Sita Ram Temple, three story temple of Balaji (hanuman temple) and Krishna Temple are located within the Galtaji temple premises. From the top of the temple, one can enjoy a great view of Jaipur and spectacular sunset. Another tourist attraction near this temple is the Sisodia Rani Ka Bagh, which is a magnificent palace and garden. Sunset is the best time to visit this temple because, this time, one can witness a large family of monkeys flocking towards the temple tank, for a bath.